Fun route features amazing roller-coaster terrain. Unbelievable fun and fantastic scenery. Like driving through a giant roller-coaster park. Well marked. 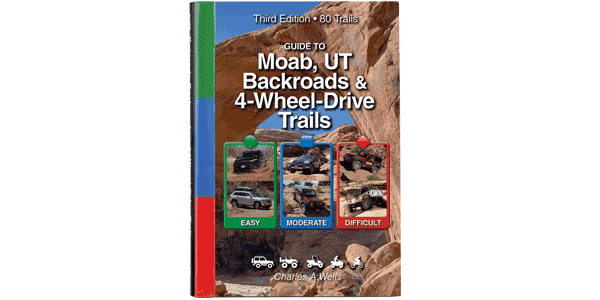 Outstanding trail for ATVs and UTVs. Helmets strongly advised. One way. Southern half is daylight hours only. Very steep slickrock climbs and descents. Few big ledges to get hung up on. Easier in short wheelbased vehicle. Compact, aggressive, stock SUVs can do it with skilled driver. Sand Flats Recreation Area is moving the start of this trail so it avoids the campground. We don’t yet have information on the new entrance but will let you know when we find out. In the meantime, ask at the entrance toll station. Hopefully, they have signage to redirect traffic. Another amazing Moab trail! This is one of our favorites that we run every trip. You will enjoy the roller-coaster ride and scenery. This trail combined with Hell's Revenge makes a very nice day of off-roading. Fun trail, I wouldn’t consider this one difficult, more moderate. But it’s definitely like a fun roller coaster ride up and down the fins.